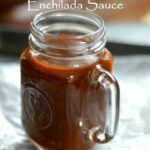 Simply THE BEST Red Enchilada Sauce EVER! Add all the spices and stir. Gradually and slowly add the broth, whisking to prevent any lumps. Simmer, stirring occasionally, for 15 minutes or until enchilada sauce thickens. Use immediately or store in an airtight container in the fridge.